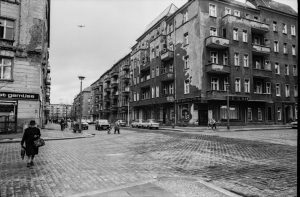 Berlin’s Historical Developments: The Tearing Apart and Rebuilding of a Single City – Good bye Lenin! This film, by way of retracing the steps of the Kerner Family, is able to take pot shots at the ideologies of both capitalism and communism. It converts this one family crisis into a symbol of Germany’s attempts to rebuild themselves as a nation and heal the wounds of their past. The historical context of this film dominates the plot and provides viewers with very little knowledge about the political era during which it was set, or how life was before the changes, or even how life changed so dramatically for those people in the East after. Of course, viewers with any personal history or memory of the time period will be whisked away to a nostalgia of the historical transformation of Germany both good and bad. Few capitals around the world have endured the tumultuous history that Berlin had to endure. As the Second World War came to a close, the allied countries including the Soviet Union, United States of America, Great Britain, and France, all signed what became known as the Potsdam Treaty. This treaty defined the borders not just for Germany but for Berlin. In the following decades, Berlin was divided between the Soviet influences of the East and the U.S., French, and British influence of the west. Soon enough the already separated city was split into two in 1961 with the creation of the Berlin Wall. The wall officially separated the German Democratic Republic (GDR) in the East from the Federal Republic of Germany (FRG) in the west. In the East, where the Kerner Family lived, the GDR maintained strict control over the lives of the citizens and city by way of communism. Families were forced to live in a restricted existence cut off from loves ones on the West with little to no contact for more than two decades. This film brings into the question the feelings a family might have faced seeing the wall get bigger and more impassable, feelings of safety for some and yet feelings of being trapped for others. Becker works hard to create a believable East Berlin, one reflective upon what it was like for families at the end of the 1980’s with people clinging to the familiar, to what they know, and younger people seeking out change from the oppression they saw in the security seen by their elders. In fact, the lead actor, the director, and the scriptwriter have personal links to East Berlin, using their personal experiences and knowledge to enhance the authenticity of the film. They coursed cars, artefacts, and clothes from that time period in order to bring to life the authenticity of the time period. Becker stated that the cost for recreating a 1989 East Berlin scene was underestimated and within two weeks the entire allocated budget had been spent. The director, Wolfgang Becker, and Alex worked hard to create a utopian German Democratic Republic, a key aspect to the film which many viewers have complained was far from the reality of the time. The film does not mention negative sides to the political party, leaving out how they spied on even their supporters, how poorly refugees trying to leave the party were treated, or of Bautzen the notorious torture prison reserved for political rebels. By not including the darker side of the East Germany government Becker has shown only a positive side influencing the overall tone of the film from one focused on the dark side of a vicious historical government to one focused on the day to day struggles of this family.